Initially a merger of two parallel efforts by humanist, atheist and other secular organizations, we’re pleased to announce today that in the first week we’ve been joined by several religious organizations speaking out against “blasphemy” laws; mostly these groups describe themselves as liberal Muslim groups or in similar terms; in addition we welcome various ex-Muslim, human rights, some Christian, and further secular and freethought groups. See our Partners page for the full and growing list of partners in this extraordinary coalition. We launched the campaign on Friday 30 January. 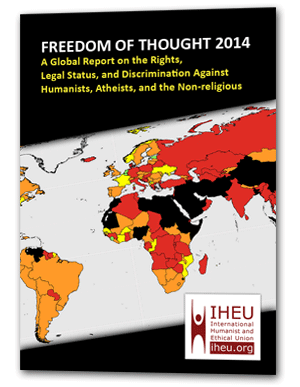 “the time is right for countries to abolish laws that protect religious sensibilities. But blasphemy laws nevertheless remain popular in many parts of the world. The BBC World Service’s “Newsday” programme lead its headlines with the story all morning. Bob Churchill from co-founding coalition partner the International Humanist and Ethical Union (IHEU) was interviewed live on the programme, and explained the necessity of a united campaign, and appeared later in the week on BBC World television, debating a proponent of “blasphemy” laws. “Two leading Canadian secularist groups, the Centre for Inquiry Canada [centreforinquiry.ca] and Humanist Canada [humanistcanada.ca], are partnering with organizations in the United Kingdom, Ireland, New Zealand, and the Philippines to launch the coalition, which was unveiled on Friday. 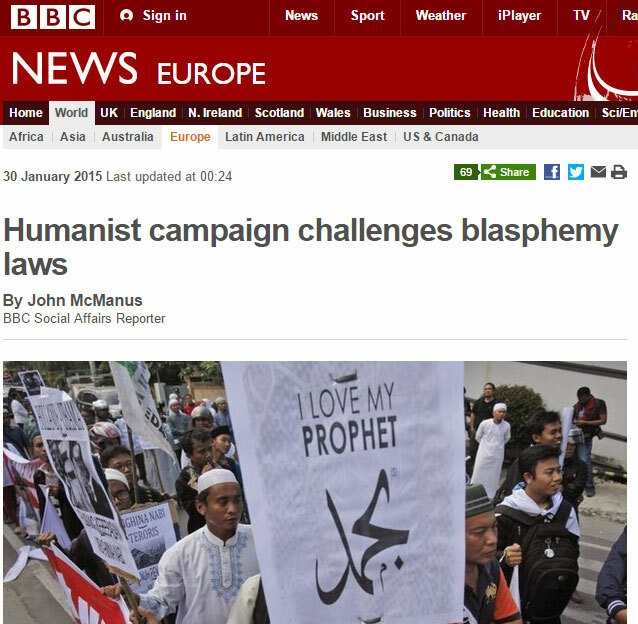 There was coverage elsewhere, for example in Italy, another country featured in the campaign for its extant “blasphemy” laws, as well as the hugely popular blog “Friendly Atheist”, and by specialist news sites such as Pakistan Christian Post, Christians in Pakistan being one of the minorities worst hit by “blasphemy” laws anywhere in the world. There was a call for Africans to support the campaign from experienced humanist and secularist campaigner Leo Igwe. Significantly there was also tacit support for the campaign from the All Party Parliamentary Group on International Freedom of Religion or Belief in the UK, and senior members of the United States Commission on International Religious Freedom made their own call (without reference to the campaign) on Tuesday: “Nations Must Repeal Blasphemy Laws”. Another high profile joiner-in was Archbishop of Canterbury, Justin Welby, head of the worldwide Anglican Communion who, quite rightly, defended the right of atheists to attack religion as being on a parallel, from a human rights perspective, with the right of the religious to preach.